To add some finishing definition to my photo, I thought I'd look for a preset. This was already in place from when I processed the flowers, and I loved what it added here, making this look like an old Kodachrome print lifted out of a scrapbook (where the dried glue had seeped through!) How funny that I use old photos and try to make them look new again and new photos to old...never quite satisfied! Ken was bringing me home from my visit with my circle of art friends, and the toll road affords some gorgeous views without all the traffic. The ease of travel is splendid of course, but the photo ops are the pot of gold! It's a long way across to those mountains, so from a moving car, I was quite happy with this memory I was able to capture! @overalvandaan haha...funny you should say that! I said to Ken, after I gave it this treatment, "Look at the old Haciendas!" OK...that's not what they're called in Italy, but it's fun to think this is "other worldly"! Thanks!! So beautiful. The editing adds such a lovely touch to this image. It reminds me of an Italian village. Breathtaking view and fav. capture. Awesome mountains. What a beautiful landscape! Those wonderful mountains with snow! You really have it all where you live! The sea and the mountains! Heaven! What a shame there are so many people and so much traffic! Love your processing here Louise! 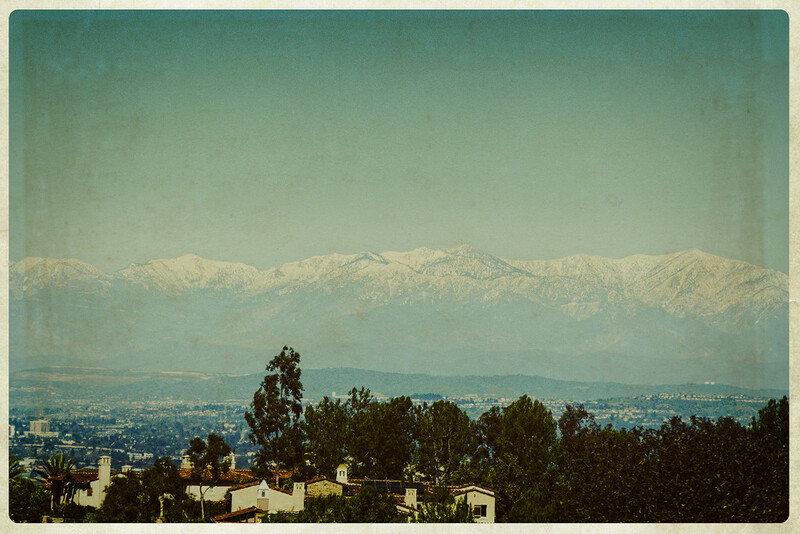 I recall this view from my childhood, when I used to live in the Yucaipa area. The 'antique' effect your editing has given this pic makes it look as if the photo was taken back in those days. Oh my, this is wonderful. Yes, it has the Kodachrome “look”! Are those the mountains you took your friends to recently? They are huge! @louannwarren Yep. the mountains that "we usually can't see except at this time of year" are huge! These are about 8000', and the mountain we drive to is about 9000' with an excellent ski area. The cabin is at about 7000'. We always look forward to January during the rainy season as, if it gets cold, this is the result! It certainly makes for a beautiful backdrop! @lyndemc Thanks, Denise! Yes, in Yucaipa you would have seen the mountains looking like this! I confess that I love to be able to drive to it if we wish, and go back to the warmth when we've had enough! @pamknowler I just wrote to Denise (above) what we like about it! Though I've only just gone up for the first time in years, it's beautiful in its own way year round. Ash and family are up there again this weekend...LOTS of snow!!! Fabulous capture! I saw photos of snow in LA and Malibu. Seems most people were perplexed by the phenomenon. @joysfocus I was hoping you'd see this; it was once your view, too, from hereabouts! it really does look like an old photo, well done. lovely cold view! It really looks like an old kodachrome photo. Beautiful! So vintage, lovely scenery , love it! Beautiful, it does have that film feel!! Oh, I do love when those mountains get snow on them. You have done a great job on the processing of this. I love it! It's amazing what you can capture from a moving car. What an impressive mountain range . Lovely shot. Could relate to your story. It is funny how we always try to change/improve things. I too noticed how particularly impressive the snow caps have looked lately. @mbrutus My favorite time of year out here when the snow-capped mountains come into view! Nice to hear from you here! Had surgery 2+ weeks ago, so laying low though I'm feeling quite well. If I don't post pix, I won't be sending comments back & forth, and I can read and rest...ok...and play a little at the computer!... I'll be back on the block again soon! Love to you and the Mrs! Get a little worried. Hope everything is well.